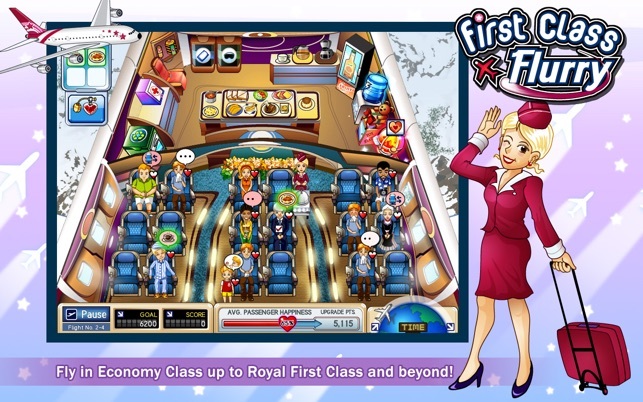 Top 10 Game in 27 countries including US, UK, Canada Australia and Germany! 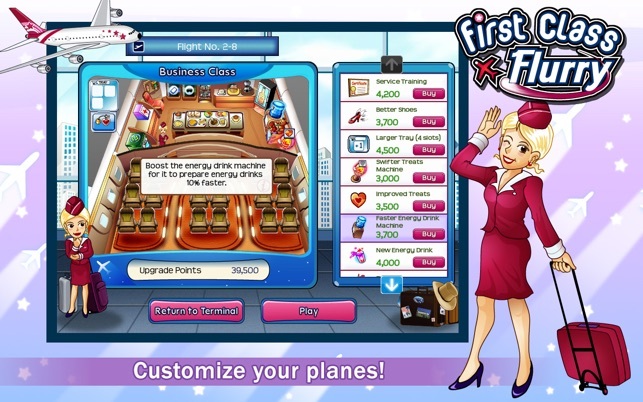 GameZebo.com (4.5/5 Stars) - "First Class Flurry engrosses from the first plane trip and doesn't stop!" 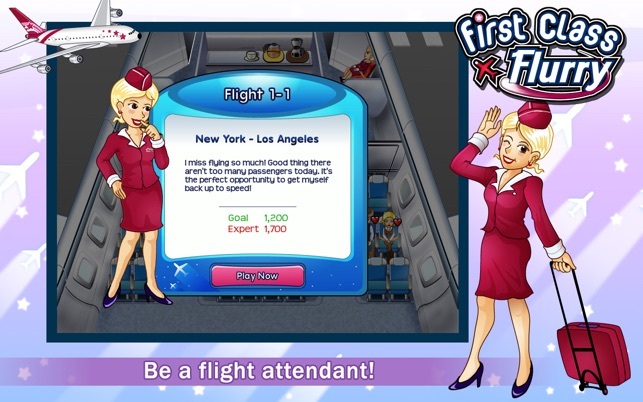 Here is your chance to become a flight attendant as First Class Flurry arrives in the Mac App Store! Good, great even, but still not "perfect"
I'm only reserving one star from this game because of some minor glitching and complaints. 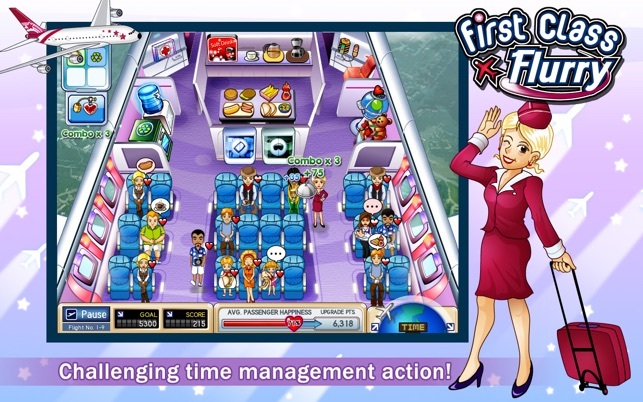 Overall this is a WONDERFUL time management game. It is fun, fast paced, just the right level of difficulty, and manages to keep things fresh and interesting on each new level of gameplay. That being said there are a FEW flaws... for one, a very, very annoying glitch where, after the captain comes in asking for tea/coffee/whatever, and you try to serve it to him, the avatar just freezes. You end up wasting almost a full minute until the captain finally goes away without even taking what you were trying to bring him. This only occurs, however, on probably 2-3 out of the 5 total levels. The only other complaints I have are 1) you run out of upgrades to buy pretty darn quickly, which is sort of one of the main points of time management games, to keep you motivated to keep "earing money" so you can keep up with the increasing pace of the game. Also the game was a bit too short for my taste...the levels don't last very long and I went through the entire game in under 2 weeks. All in all, this is a great game for it's price/value, and I'm glad I bought it, because it was extremely fun to play. 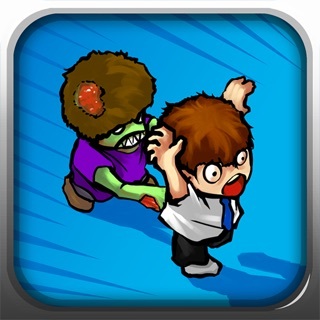 There are, however, better TM games out there, and this one could do with some improvements as well. This game is really fun. It gets pretty challenging quickly. I'll be on a 15 hour flight soon and I know that I'll be playing this to pass some time. 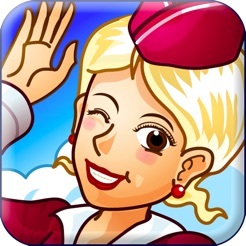 © 2008-2011 ViquaSoft Co., Ltd.